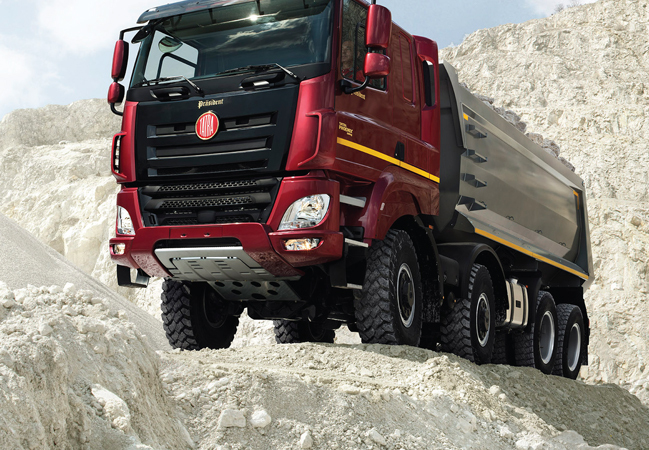 Manufactured in the Czech Republic, TATRA trucks are global leaders in highly specialised, off-road applications. As the sole importer of TATRA trucks in Australia, Offroad Trucks Australia is proud of the fact that we offer unparalleled transport solutions for a wide range of industrial applications in Australia. The vehicles that we supply are designed for extreme customisation. This means that we can help you obtain precisely the type of vehicle you require. Whether it needs to be tailored for excavation, heavy-duty transport or extreme off-road navigation, the vehicles we supply are undeniably up to the task. You won’t find a better-engineered machine anywhere in the world. And if you’d like to secure one in Australia, Offroad Trucks is the only supplier that can make that happen. We’re proud to be on the leading edge of heavy-duty, off-road machinery in a part of the world that has so many ideal applications for vehicles like ours. When you invest in a vehicle as precisely designed and finely tuned as a TATRA truck, you need the assistance of a team of specialists to help you care for it. Of course, when a vehicle is engineered like a TATRA truck, it rarely needs to be serviced or repaired. But when it does, you certainly want to look beyond the run-of- the-mill service teams for help. At Offroad Trucks Australia, we understand that representing one of the world’s leading heavy-duty truck manufacturers is a major responsibility. From our perspective, it wouldn’t be enough to simply help our clients secure precisely the type of vehicle they require for their applications. We also need to be able to ensure that their vehicles receive the care and attention they require over the lifetime of the truck. For that reason, Offroad Trucks Australia also supplies specialised replacement parts for TATRA trucks. We have access to all of the tools, spare parts and accessories to keep your off-road truck in peak operational performance. And as the sole suppliers of these trucks and components in Australia, the parts and labour that we provide are fully backed by the TATRA factory in the CzechRepublic. TATRA trucks are an unrivalled feat of engineering. Each vehicle our partner manufactures has been customised to suit the specific needs of the end user. Accomplishing this requires a great deal of specialist design and manufacturing. And as you can imagine, this level of superior engineering makes it difficult to find parts that are up to standard for the vehicle you’re operating. But thanks to Offroad Trucks, this simply isn’t an issue for our customers in Australia. Our mission is to ensure that every organisation that is keen to take advantage of the superior performance provided by TATRA trucks is also able to find the parts and supplies they need to maintain those performance benchmarks. And our partnership with the Czech manufacturer means that you can dojust that. vehicles. The trucks they manufacture are durable and built to take a beating. But when environmental conditions make breakdowns all but inevitable, they see to it that we’re fully supplied with the parts we need to keep their reputation intact. If you’re operating a TATRA truck in Australia, we can keep them equipped with the parts they were intended to run on. Supplying the parts our clients need is a critical element of our service model, but we also follow through with the know-how required to keep these vehicles in peak operational order. TATRA insists on nothing short of definitive expertise when it comes to maintaining their vehicles. With that in mind, our technicians know these machines inside and out. When your TATRA truck does require servicing, Offroad Trucks Australia has you covered. We offer 100 percent of the parts you may need. And our fully trained TATRA mechanics are also available to assist with repairs, routine maintenance and technical support. TATRA trucks are reliable, durable and easy to maintain. Every machine has its limits – but the standard has been set high for these vehicles. We’re also the Australian agent for Kobit, the Czech-based company that builds service and fuel tanks, water modules and other add-ons to mount on the TATRA chassis. Contact us today to learn more about TATRA vehicles, or to request the parts and service you need to keep your truck in top condition.